This past weekend I joined up with some new friends to run a 24 hour relay race in Jefferson GA. There were 8 of us on the team. 4 women and 4 men. 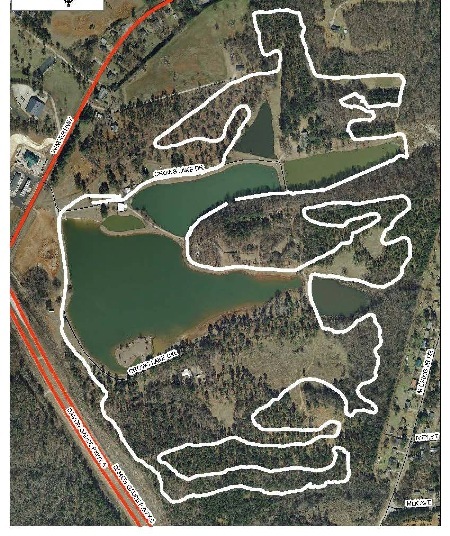 The course was a 10k “loop” through woods, over a meadow, and around parts of a lake. Each one of us ran the loop, one after the other. The goal was to get as many loops as possible. The course was up and down a lot, and it was a bit confusing trying to follow the trail. But I finished fine, without missing any turns, and felt pretty good about my 65 minute time. 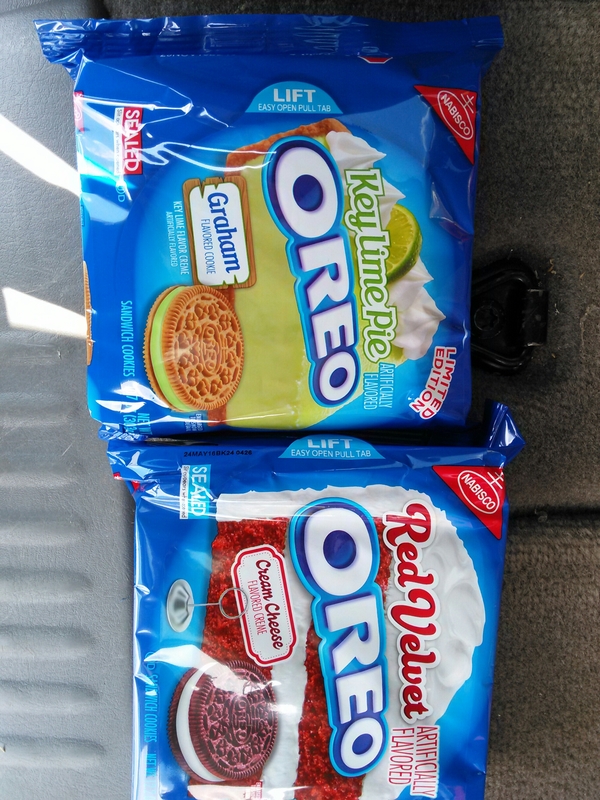 Cookie review: everyone enjoyed both flavors! I’d been eager to try each one, but knew better than to buy a pack of either one for myself. I wouldn’t be able to stop myself from eating every single one! But the race seemed like an awesome time to try them…lots of calorie burning plus sharing! The rest of my team ran their laps in pure Georgia heat and humidity. It truly was brutal. I am surprised that only one race participant went down (from another team). My next lap was at sunset. Still hot, but not as bad as what my teammates had faced. Finished that one in 67 minutes. It was 9:15ish by the time I finished. I hopped in my car and went home for a shower and nap. Was back on the road at 3 am. Crazy?? My final lap was in pitch black. I had on a headlamp. And carried a flashlight in my hand. Both were needed. The flashlight picked out the stumps, and roots, and ruts, while the headlamp lit my path. It was kind of scary. One of my teammates reported hearing a deer snort. It literally scared the pee out of her! I really had to slow down and concentrate hard not to miss the trail markers in the dark. It took me 75 minutes, but I’m proud to say I didn’t get lost or fall down, or walk, or miss any of the turns! My family all laughed at me when I told them I pretended to be a native American warrior on my first test of manhood. But hey, I guess I passed even if I don’t fit any of the characteristics! Fun race, nice people…I think I’d do it again! This entry was posted in deer, diet, downhill running, fitness, food, morning run, nature, parenting, race, racing, Run, running, ultra marathon, wildlife and tagged cookies, crows lake, Jefferson GA, Oreo review, outdoor mafia, relay race, run, running, running happiness, running in pitch black, running in the heat on July 12, 2016 by Rebecca Royy. This week, I’ve seen a lot of wildlife while on my runs. On Monday morning, I saw 2 bunnies and 4 deer. The next morning only one deer. Today I saw Canadian geese and some ducks. The geese cracked me up. One goose pinched another goose’s tail feathers with its beak. Is this where the phrase ‘goosed’ comes from? Today I came home from work pretty stressed out from bad traffic. The exterminator was there waiting for me. He was here to do his annual inspection, and needed to check the basement. When we went down there, I could see through a window that a deer was in my backyard. A bit uncommon, but I know they’re here because they’ve devoured my hostas. I know this isn’t the rabbits’ work because I can see hoof marks in the pine straw. Anyway, the exterminator and I went over to the window to look at it, and then we saw her baby!! Nursing! I’ve never seen that before. It was sooo awesome! The fawn was no bigger than a beagle, with spots and wobbly legs. It must have been a very new fawn. 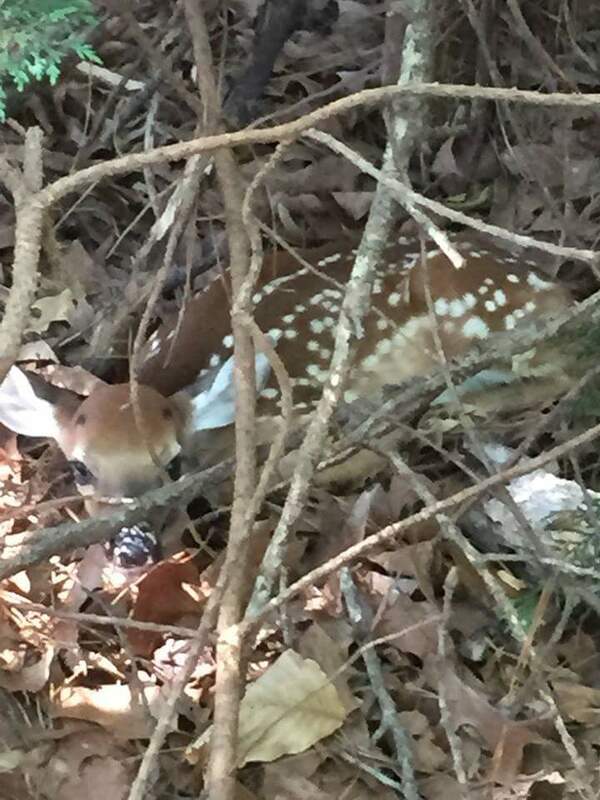 I think it is fawn season, because a friend posted this pic on Facebook. I’ve spent the last few hours checking to see if I can see them again. But they seem to be gone. This entry was posted in deer, morning run, nature, Run, running, wildlife on June 23, 2016 by Rebecca Royy.